a- you're recording too much feedback. b- there's no feedback there. a- no, there's too much air, like, all the air movement, flowing, past. i can hear it. b- yeah, but i'm not trying. a- yeah, yeah - “i'm not trying!” what are you doing? what? what! b- i'm just doing it. a- don't push it. what the… what the thing is, is that this machine doesn't record the person that's recording it going “oh, i give up.” it's always getting the other people, pushing the limits and pushing the boundaries, but it doesn't get the fact that the people that are recording it can't handle pushing it, and just give up, like they're just taking the easy path and they just record. record, record, record. b- oh, is that what it's all about? a- that's what… you're not recording it for other people, you're recording it for yourself. you shouldn't record drunk people either. b- no, because it's nice to share it. a- what, with drunk people? it's like a prankster thing, that's the thing that shits me. b- no, it's not. no it's not, man. a- …recording drunk people. you know, like. c- i bet you he probably did. c- …you don't see it. a- and you don't hear it because they didn't have recording devices. b- yeah, but in the same way, they, they, err… speak the dialogue from this person, like they, they re-create the scene, and they write it down, and what's the difference between y… y… b… at least you have more say if you're actually in it and you're actually saying it. b- otherwise it's somebody just remembering what you say. a- yeah, but that's… the beauty of… the beauty of, like, going through these different transitions, from, erm… writing to… you know, it goes through that process. like, this is really direct, like. if you're talking about drawing being direct, like recording is full on… raw… that's it – it's bloody. a- and it speaks no lies. a- yeah. no one can romanticise this – this is drunken conversation. b- yeah but that's why it's so wonderful as well. a- but i want to live the good life. i want to be romantic. b- yeah and that's… that's fine too, why can't you do that? a- cos it get… it gets recorded. it's just a truthful sort of drunken, debaucherous night. b- yeah but why does that stop it from being… i think that makes it more romantic. Bring on the Badest of the Brilliant Brains! 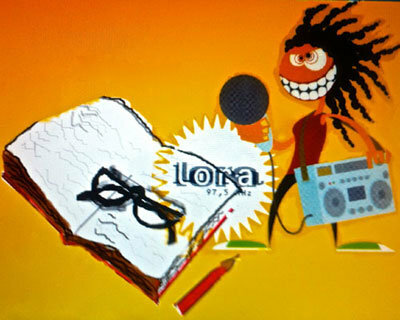 For the fifth time Radio LoRa will have a Literature Week starting from 26 July to 1st of August 2013. A whole week of Literature work ranging from a variety of short stories, Poetry Slam competition, readings from celebrated authors in different languages, texts and much more. We might even thrown in some Poetry punk music just for the heck of it. Zum Fünften mal findet die Literaturwoche auf Radio LoRa statt von 26. Juli bis 1. August 2013. Eine ganze Woche Literatur auf Radio LoRa, Gedichte, Poetry Slam Wettbewerb, Bücher, Texte ..... ein bisschen Poetry punk musik, SOGAR! Künstlerisches und experimentelles Radio für Zürich auf 97,5 MHz vom 18. Juli bis zum 10. 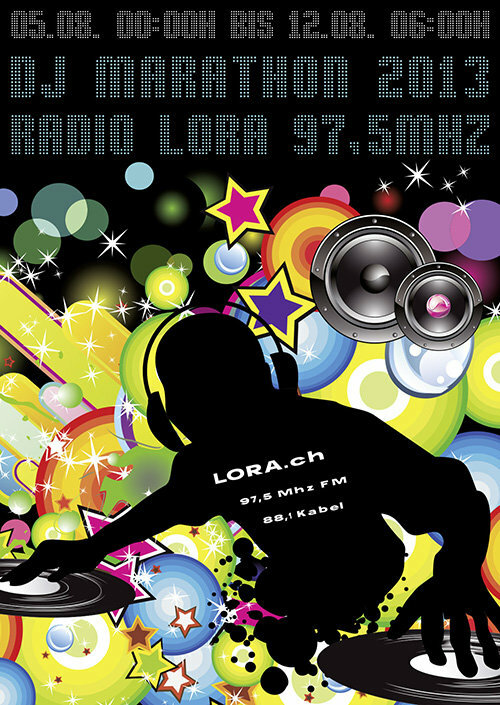 August 2005 von Radio LoRa und NOW.